The Child Care Team is our church’s volunteers who take turns working in our church nursery. Our nursery is for children ages birth to three years. We offer the nursery at all worship services on Sunday and Wednesday. Parents should provide diapers and/or pull-ups and alert volunteers of any allergies. Bottles must be provided for those children not eating solid foods. Snacks will be provided as needed to older children in nursery. If you would like to volunteer in the nursery, please contact Nancy Hite, the Child Care Team leader. A short informational form must be provided by the volunteer and a state background check completed to become a nursery worker. Impact Leaders is a youth group for high school students. It’s a place to gather with friends or make new ones. It’s a relaxed environment where students have the opportunity to discover biblical truth and discuss real world application. More than anything it’s a place to discover the person God created you to be in Christ. One thing’s for sure, it’s a great place for teens to be on Wednesday nights starting at 6:45. Impact 180 is a youth group for students in fifth through eighth grades. Students are reminded often that there is only one rule at youth group. Respect. Learning to respect God, respect others, and respect yourself goes a long way. The Bible has a lot to say about these things. Students learn important biblical truths and have an opportunity to discuss them in small groups. Impact 180 meets on Wednesday nights during the school year. A light meal is served at 5:30. Impact Kids is designed to partner with parents in the training of children. Proverbs 22:6 tells us, “Train up a child in the way he should go, Even when he is old he will not depart from it.” The heart of Impact Kids is to instill biblical truth in the hearts and minds of children, so that they know God loves them and wants to have a relationship with them. We understand that the home is the primary teaching environment and that parents are the number one influencer in their children’s lives. We want to assist parents in this huge responsibility. You and your child are welcome to join us on Wednesday nights. A light meal is served at 5:30. God has given us the study of the Bible, His Holy Word, and prayer as the two primary means by which we can enjoy fellowship with Him and grow in our Christian walk. We have a variety of adult classes to serve a variety of people and encourage visitors to check out more than one class before settling in to a study group. The material used in different classes varies from lessons that require personal time in study during the week to video lessons that are designed to engage and stimulate conversation without a need for prior preparation. We strive to provide studies that encourage, challenge and grow us in our walk with Christ, yet with each lesson being a stand alone study so that a visitor can actively participate in the class. We want people to feel welcome to join in the discussion or just listen in. The most important thing is to have you with us growing through the study of God’s word. Our Sunday morning Bible study groups emphasize the study and application of God’s word, prayer, caring fellowship and outreach. Our meeting time is 9:30 – 10:30 AM with Sunday morning worship beginning at 10:45 AM. Please come and join us! Our small group discipleship ministry has as its primary goal “the equipping of the saints for the work of service, to the building up of the body of Christ.” (Eph 4:12) Expository preaching of Scripture during formal worship services reinforces right doctrine and shepherds the body as a whole in biblical principles and their application; however, indepth learning is most effective in smaller group settings that encourage interaction. Therefore, we encourage the reading and studying of material beforehand and participation in discussion during meetings. These times of ‘iron sharpening iron’ greatly facilitate learning as group members share both their understanding of the biblical principles being presented and their application to our daily lives. Because a hallmark of the Christian life is Christ-like change brought about by spiritual growth, small group discipleship is an essential ministry of the church and one we encourage everyone to be a part of. The Joy Group (Just Over Youth) is a senior citizen fellowship that meets the second Tuesday of each month March – December. We enjoy taking local trips and serving others in our community, especially the residents of our local care center. If you fit this age group and like to fellowship with other Christians come join the Joy Group. Remember GOD IS GOOD – ALL THE TIME. We worship because of His gift for us. That, above all else, is why we worship. We worship to show our gratitude, devotion, and commitment to Him and His plan for our lives. Only Jesus is worthy of worship as our Savior. Only in Him may we be saved. The Worship Team has a primary goal of facilitating our corporate worship. The Worship Team enhances corporate worship by planning worship services that include a variety of ways to worship. Every person should be able to find at least a part of every service that instills worship in his or her heart. Services include favorite hymns, traditional music, praise music, worship music, special solos and choir numbers, and, of course, a sermon from the Word of God. Other special emphases include an annual church talent night, dramas and skits, a worship Faith Lift revival annually, cantatas at Christmas and Easter, and testimonies during a service. As Christians, we need to be diligent and faithful in our worship reflecting our devotion to Jesus for His provision to us. This means we should gladly attend worship every time we have an opportunity. We should be examples to the community that Jesus is indeed a vital part of our lives. The mission of the FBC Hospitality Team is to demonstrate Christ’s love through serving and ministering to the body of believers and to strangers. We aim to do this by cultivating an environment full of servanthood and by encouraging fellowship, and provide a spiritual center of food and fellowship where all are welcome. Ultimately, the aim is to serve others and give them all that we have in order to make them feel comfortable, encouraged, and loved. The Hospitality Team shall support the ministries of all other teams. The ladies of the church are considered to be on the hospitality team. There are two people on each quarter who take responsibility for making phone calls and arranging for food and help for special events of the church. 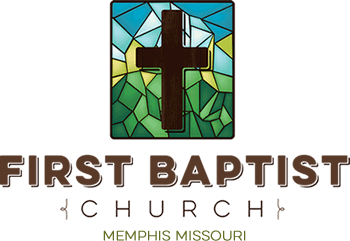 All Content Copyright © 2019 First Baptist Church | Website Design & Development Britta burrus design.